Moths are able to enjoy a pollinator's buffet of flowers – in spite of being among the insect world's picky eaters – because of two distinct "channels" in their brains, scientists at the University of Washington and University of Arizona have discovered. One olfactory channel governs innate preferences of the palm-sized hawk moths that were studied – insects capable of traveling miles in a single night in search of favored blossoms. The other allows them to learn about alternate sources of nectar when their first choices are not available. 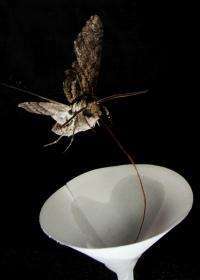 For moths, the ability to seek and remember alternate sources of food helps them survive harsh, food-deprived conditions. Scientists knew bees could learn, but this is the first proof that moths can too. A better understanding of the moth's neural basis of olfactory specialization and learning also might lead to insights into how human noses and brains process odor, according to Jeffrey Riffell, a UW assistant professor of biology and lead author of a paper published Thursday (Dec. 6) in Science Express, the early online edition of the journal Science. Many of the mechanisms insects use to process olfactory information are similar to humans, and moths have long served as a model system for behavior and neurobiology, he said. The moths, Manduca sexta, are commonly called hawk moths and are found throughout North and South America. As caterpillars they are known as the tobacco hornworms – bright green, thicker than a man's thumb and one alone can eat a tomato plant to the ground. They become moths two to three inches in length and they are important pollinators of night-blooming flowers, Riffell said. 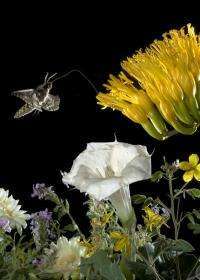 To investigate innate preferences, scent samples were collected from flowers that scientists observed were regularly visited by hawk moths in the wild. Scents were also collected from closely related flowers, but ones hawk moths tended to shun. Analyzing the scents in the lab, the scientists found most of the preferred flowers shared a remarkably similar chemical profile dominated by certain oxygenated aromatic compounds. It didn't matter that some of the plants evolved 10 million to 50 million years apart from each other – their scents have the same chemical composition that holds appeal for hawk moths, Riffell said. The scientists then used electronic recorders through the moths' antennae – which in part function as their noses – to identify the olfactory channel in use when the moths were exposed to key chemicals from preferred flowers. The moths categorized, or grouped, the moth-pollinated flowers in the exact same manner in the olfactory lobe, Riffell said. Non-preferred flowers failed to activate any particular neural pathways. To check their findings, scents of preferred and non-preferred flowers were offered to "naive" moths, those raised on a soybean diet and never seeing real flowers. "What we found was really amazing. A naive moth will go mainly to flowers that had been attractive to moths in the wild, from flower to flower as if they were the same flower, responding in the very same manner," Riffell said. "These favored flowers look very different from each other, it's the odor that's driving the behavior." Distinct from this channel of innate odor preferences, there appears to be another olfactory channel employed when moths learn about alternate food sources, the scientists found. In the wild, moths go to preferred flowers but also to other flowers. The agave, or century plant, for example, is adapted for pollination by bats but it is such a cornucopia of nectar that bees, birds and other pollinators seek it out, especially in desert environments, Riffell said. Scientists trained moths in the lab to associate sugar-water rewards with the scent of agave while recording their brain activity. They found the neural modulator octopamine is released in their brains as the signal to remember an important food resource. Further, the scientists found that learning about an alternate food source doesn't extinguish the moth's innate preferences, something that can happen with bees. Together the two olfactory channels mean moths can survive in a changing floral environment, where at times their favored flowers might not be available, yet still maintain their innate preferences. 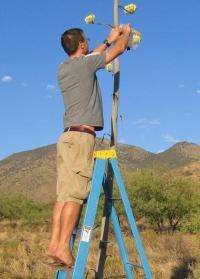 The approach using observations and experiments in both natural settings and labs, is one promoted by the University of Arizona's John Hildebrand, a co-author of the paper. Riffell did postdoctoral research in Hildebrand's lab. "This study is based on observations of wild animals in the real world. We think it's critically important to know what the animals do in the natural world, not just what they do in the lab," said Hildebrand. "It's not enough for us to show what the animal can do under artificial conditions – we want to know the basis for what the animal does when it's living out in the world." More information: "Neural Basis of a Pollinator's Buffet: Olfactory Specialization and Learning in Manduca sexta," by J.A. Riffell, Science, 2012.